If your dream is to go fast, really fast, then Mecum may have the machines of your dreams crossing the auction block in Monterey. They will have a number of historically significant race cars on auction during Monterey Car Week. The offerings include a few Indy Cars a 1959 Bocar XP-5 and a 1986 Porsche 962 (that we would love to have in our garage, hint, hint Santa Claus). Below are some of the competition machines that you could purchase, if you have the cash. We expect for these to fetch a decent price so you would need a lot of money. We are less than a month away from when we make our yearly pilgrimage to automotive Mecca. Monterey Car Week will be the place to be if you are an automotive enthusiast. From historic cars racing at Laguna Seca to car shows and auctions, the week has it all with everything leading up to the Pebble Beach Concours d’Elegance. One of the auction houses that will be in Monterey is Mecum. They will be offering over 600 collector cars including some very special Porsches, Ferraris, Lamborghinis and Corvettes. This past weekend was Rennsport Reunion V. The event was the place to be for any Porsche enthusiast as historic competition machines from the automaker took to Laguna Seca. The amount of cars in the Monterey Peninsula from the German performance manufacture was simply staggering. Just about everywhere you looked in or around Laguna Seca was a Porsche. This past weekend was the Goodwood Festival of Speed. The time of year when some of the fastest machines to ever hit the road go hill climbing. This year Porsche had plenty of great cars, including the 918 Spyder and Turbo S. But, it is the racing machines that are the biggest highlight. 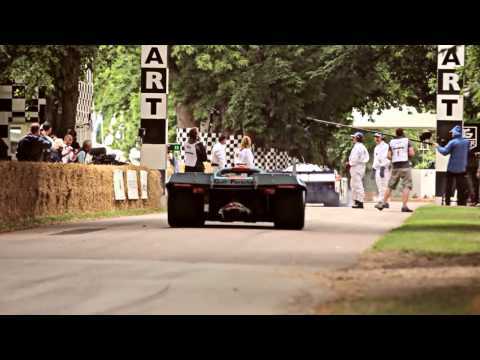 This video highlights the Porsche race cars at Goodwood, including the 917 and RS Spyder. One of the most enjoyable parts of the event is the music of those engines and exhaust.